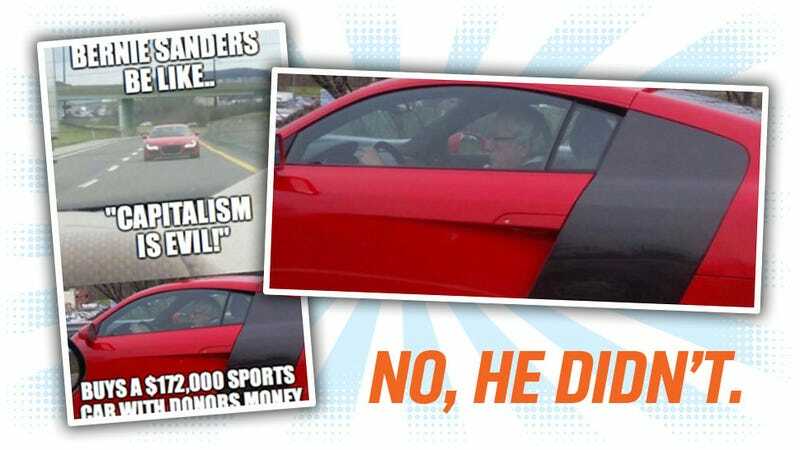 Over the past day or so, a picture that’s allegedly of Bernie Sanders driving a roughly $160,000 Audi R8 has been circulating online, along with the allegations that he purchased the car with donor money. Is any of this even remotely true? Um, no. I know it’s astounding that something that shows up on 4Chan might not be 100 percent absolutely, verifiably true, but there’s roughly zero evidence that Sanders has used campaign contributions for anything like this, or even if that guy in the R8 is Bernie Sanders at all. While most news organizations have just left it at that, we at Jalopnik decided to go a bit further and try to really get to the bottom of this, and where that original photo came from. The Jalopnik mainframe (located in a bunker underneath Delta Burke’s Athens, GA-area training dojo) determined that the driver is Bernie Sanders, but noted that the refractive index on the windows and body did not match expected parameters for an Audi R8 in the apparent lighting. Now this all makes sense. Bernie really just wanted to look cool, so he spent $38.46 of campaign funds at a Kinko’s (or whatever they’re called now) and had a pair of R8 panels printed on foamcore, which he tied to his 1981 Dodge Colt with twine. Campaign staffers claim he found the twine in a wastebasket at a campaign stop in Lansing, MI. We contacted the Sanders campaign, and a representative personally assured us that he will have Sanders reimburse the campaign for the costs, and while we were on the phone, she told us that she had already taken two $20 bills out of Bernie’s wallet, which we confirmed by letting us hear the sound of the Velcro open and close. There you go. Mystery Solved!